A much loved Alaskan snack, this salmon jerky recipe is perfect for those looking for an unusual, delicious bite to eat on the go. Rosana cures the salmon fillet in maple syrup, liquid smoke and soy sauce before drying out at a low temperature, imparting a sweet, smoky and savoury flavour into the fish. Jerky is lean and protein-dense meat, cut into strips and dried to avoid spoilage. After the process the meat or fish weight is considerably reduced as the moisture is removed, and can be stored outside the fridge, making it a convenient portable snack. Jerky is an ancient process of meat preservation from animal meat. The word "jerky" comes from the Quechua word ch'arki, a particular type of dried and salted meat from South America. The basic "jerky" method includes drying out the meat at a low temperature and the addition of salt to inhibit bacterial growth. The result is a salty and savoury jerky snack. But often a sweet or semi-sweet recipe is used, with sugar, honey or maple syrup being the primary element of the rub or marinade to counteract any harsh saltiness. Cold water seafood is the centrepiece of Alaskan cuisine. Wild salmon is one of the most important foods in the country, and is served as smoked salmon, cured salmon, salmon jerky, and even sweetened Indian salmon candy. Wild salmon jerky is a traditional snack. If done according to the recipe it can be stored for months without refrigeration, vacuum packed. 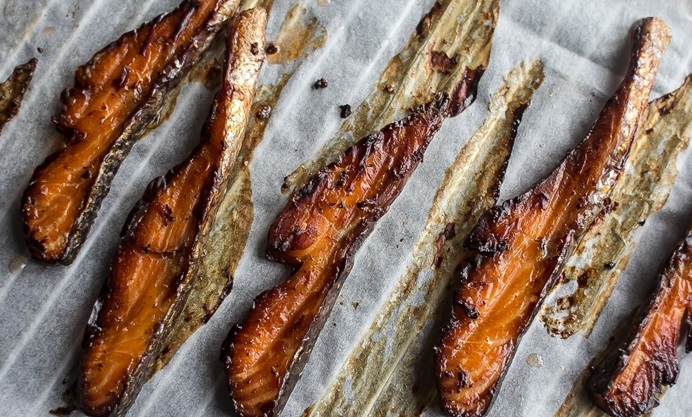 Salmon jerky is high in protein and loaded with heart-healthy Omega-3 oils. 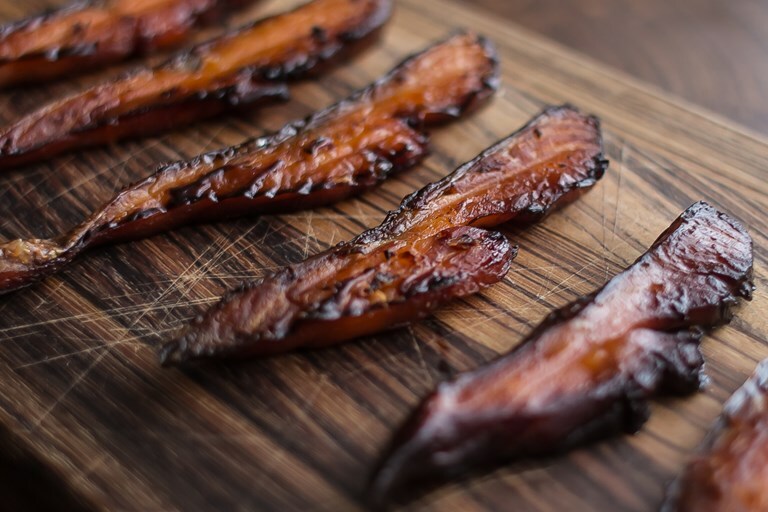 The method below will produce a homemade, tasty, slightly chewy textured salmon jerky with an incredible smoky flavour. No need for a dehydrator or smoking device, this process can be made at home in the domestic oven.